It has a long way to go. But at least it is organized for now. I’ll go ahead and post the photo now so you can see it. better than it was, but not quite finished. I’m not gonna lie. When we first looked at this house, I was instantly in love with the kitchen AND THE PANTRY! In our last house, we didn’t really have a pantry. Our washer and dryer were in the kitchen behind bi-fold oak doors (blech!). I had to stuff all the little appliances, food, paper products and other “pantry” stuff in the cabinets or in other closets throughout the house. Soon after we moved into that house, we had to purchase a new washer and dryer so we purchased a pair that could be stacked. That then gave me room to add shelves in that “laundry/pantry”. It was what we had so we made it work. And I hated.it.every.single.day. I mean seriously, look at that pantry! It reminds me of an old-fashioned candy store! Everything in clean jars! This one is almost exactly the size and shape of our new pantry. 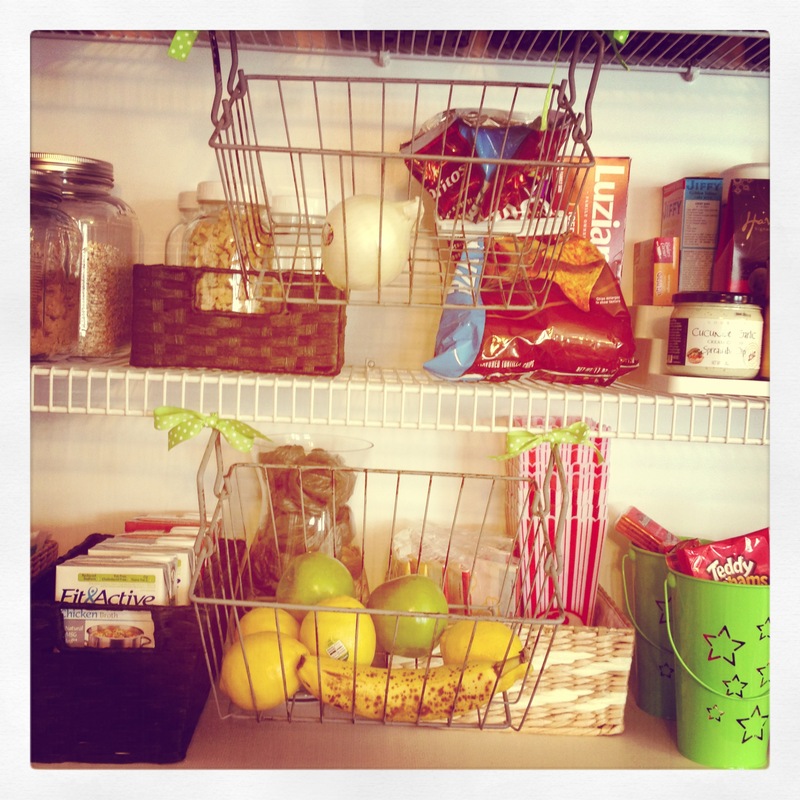 And I love Shelley’s Pantry at House of Smiths! Soooo…back to our new pantry. Now that we live in the country we have mice. I had been warned. I knew they were here. I saw the “evidence”. everywhere. in. the. kitchen. Here is some evidence of them being in the pantry. So I had to clean out the pantry anyway, so I just decided that would be a great time to reorganize it. On the top shelf, I put things up there that don’t get used often, but that I still want in the kitchen. I bought 12 red “school lunch” plates a while back when our church was selling our old building. I love them and just can’t seem to find a reason to get rid of them. They make me happy! I also went through my utensil drawer and pulled out everything that I don’t use at least every week. I put that in one of the baskets on the top shelf. In it are things like the cheese grater, corn-on-the-cob holders, candy thermometer, and things like that. In another basket up there are all our plastic silverware. On the next shelf down are all the canned foods, then the dry goods, like pasta, oats, brown sugar are in clear glass jars that I bought at The Walmart and The Meijer. I see that there is a sneaky bag of Doritos there, but that is now in a clear plastic container. I tied wire baskets to the shelves. The top one is for potatoes and onions and the bottom one is for fresh fruits, and it’s in reach for the Little Man to reach the apples and bananas for after school snacks. Also the little lime green buckets hold little snacks also. 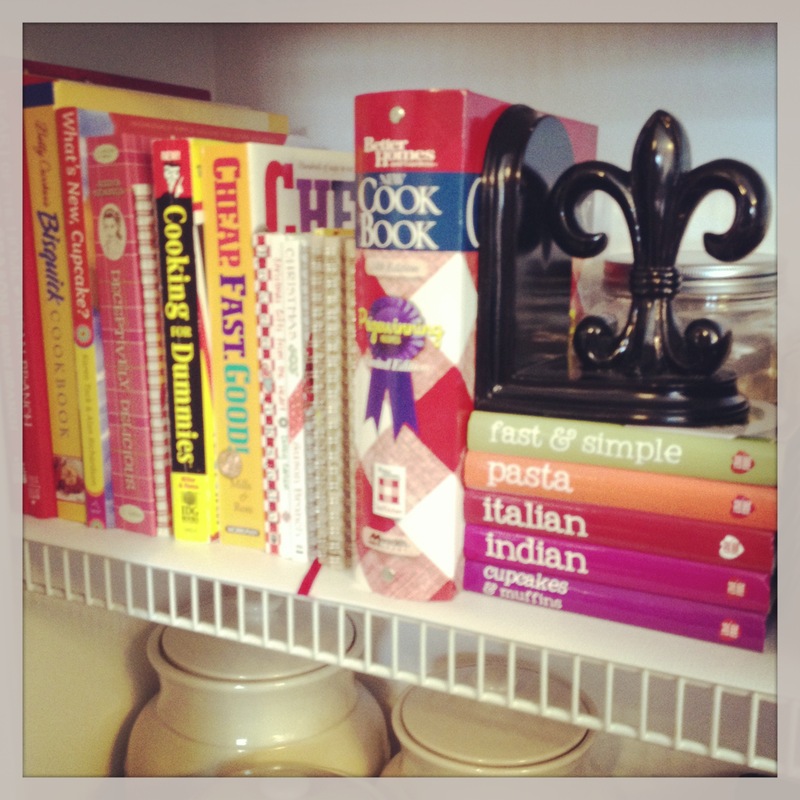 And yes, I made my cookbooks look pretty! Just because it’s a pantry doesn’t mean it can’t look pretty. Right?!? I also moved my Longaberger pottery canisters into the pantry. I had them on the kitchen counter over in the corner by the stove. 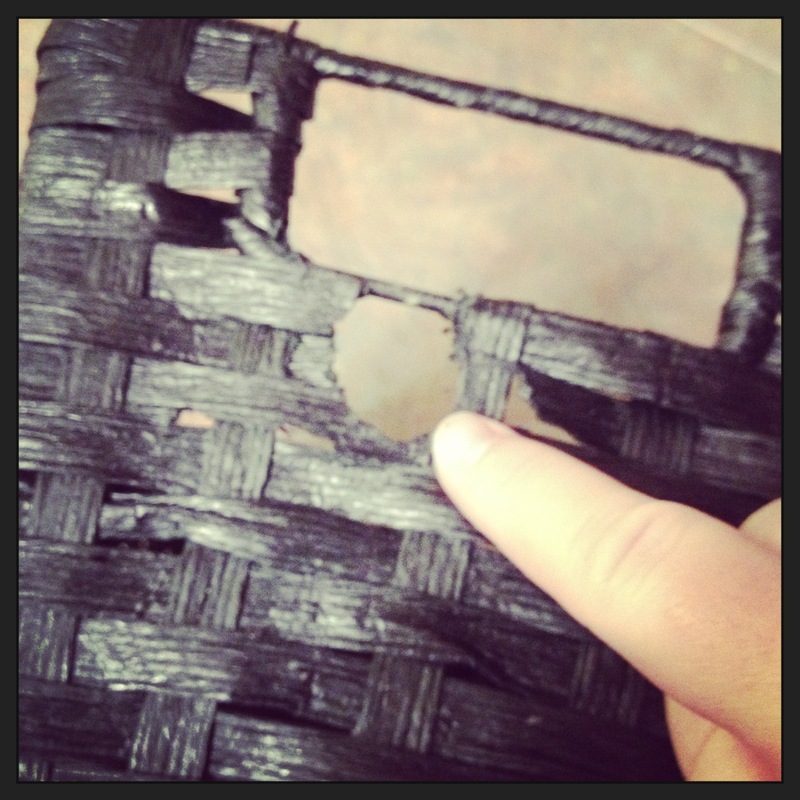 But I never felt safe reaching for them because I would have to lean over the stove, sometimes even when cooking. I was afraid I’d burn myself. So they didn’t work for me on the counter. In the baskets on the floor are the reusable/travel mugs and other plastic containers that don’t fit other places but need to be easily accessible. I’ve had dreams of a nice, neat, organized pantry. I want it to serve my family. I want it to be tidy. Knowing what’s behind the closed doors, when I open it now, I open it with a “flourish” and think (and sometimes say out loud) “Voila!” I can hear angels singing in the background…AHHHHHHMMMEEEEEEEENNNN! I’m sure I’ll still tweak it here and there, and after living with it for a while, we’ll have to see what works and what doesn’t really work for us. But for now, I feel like that’s one item I can successfully cross off the “new home” list. 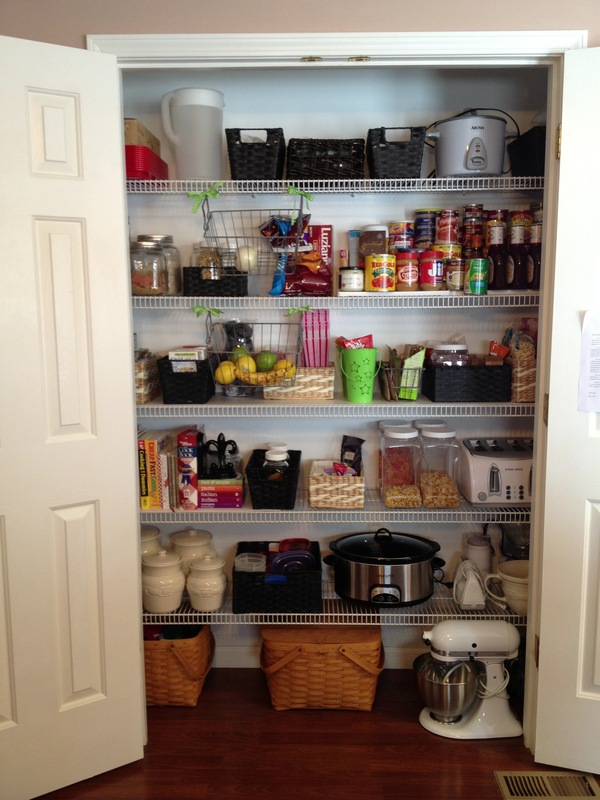 This entry was posted in Uncategorized and tagged pantry by palmtreejen. Bookmark the permalink. 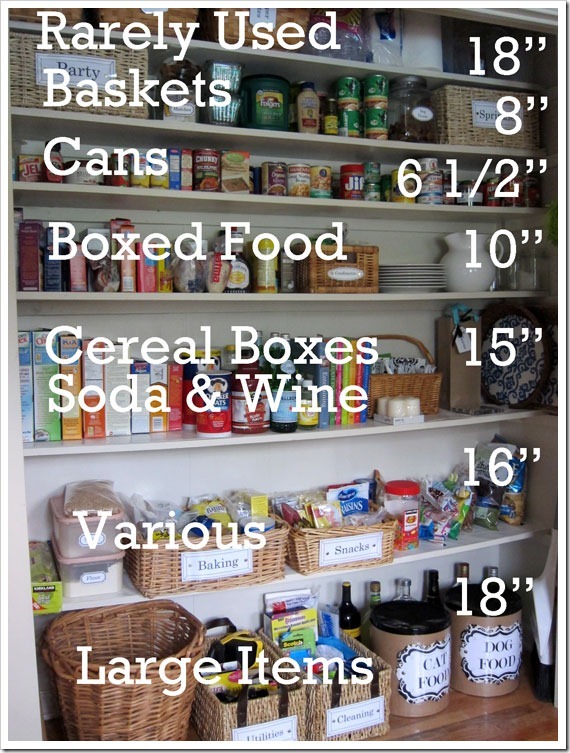 Um, if you do the pantry like the one in the very top picture (with all the jars) I will be over to gaze upon it whenever stress hits me. Organization like that is my Xanax. Consider yourself warned. LOL! Lori, it’s not exactly like that one, but i love it! Absolutely beautiful. You must feel like a million bucks when you go to the pantry! Thank you! It certainly helps for everything to have a place and just as long as everyone puts things back where they belong, it stays pretty organized!